Welcome to my life right now. I can’t think of anything but the marathon at this point. I wake up thinking about it. I am thinking about all day long – every time I walk up the stairs and I feel a little twinge in my knee, every time I see my running shoes in the corner, every time I see someone running down the street, every time I eat something… I fall asleep thinking about the marathon. It’s exhausting. I am a bit obsessive and that’s making it worse. These next five days may be some really long days. In my last post, I mentioned that I decided what pants I’m gonna run in. I still don’t know about a shirt because it may be HOT. Okay – not hot, but REALLY WARM in Houston on Sunday. The high is predicted to be 69 degrees. 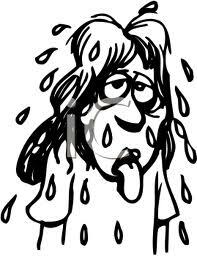 When I’m running, 69 and 65% humidity feels like 90 degrees. Eso no es bueno… Remember, I live in the midwest. It’s been cold here for WEEKS AND WEEKS. I may run in a tank top. I don’t generally like running sleeveless because I am bothered by ‘the jiggle’, but I might have to bite the bullet and do it. I’m trying to create the best possible scenario for myself! Running hot is not good. I guess the heat will take away the need for ear warmers and gloves . Will I need a ‘throw away’ jacket? I don’t really do ‘throw away’, though. It might be more like ‘tie around my waist til I see someone I know who can take it from me’. I am too cheap to throw a jacket on the ground – even if I got it from Goodwill for the purpose of throwing it on the grown. Decisions, decisions. Oh, I went to the physical therapist on Monday. I have some strengthening exercises to see if I can get a last minute boost. They made my knee hurt so I’m not sure how helpful they will be for Sunday. I teared up a little bit on Monday when the guy reacted that way. I think he may be a running snob. He talked about how after the marathon we could work on my form and went on to demonstrate how lots of runners sway back and forth too much, swing their arms wildly and move their upper bodies too much when they run. He was assuming that I MUST do one of those things. 2 Responses to FIVE Days… FIVE Days!